From my review on goodreadswithronna, where you can find the latest and greatest in children’s literature and educational products. It’s summer, and Duck is eager to explore. Goose, however, is reluctant to leave their perfect little meadow with its tree stump, hollow log, stream, lily pond, and shady thicket. “A TRIP? A trip sounds far away. I like close…An adventure? That sounds scary,” Goose honks. But Duck is determined, and Goose grumpily follows him on their hike. When they arrive at the beach, Duck gets more than he bargained for. The waves are loud, the sand is hot, the ocean is big, and the beach dwellers are different. The beach isn’t what Duck expected, but it isn’t what Goose expected either, and, suddenly, he’s up for the adventure! Goose stared at the vast stretch of sky, sand, and sea. “Isn’t it magnificent?” he said. “Have you ever seen SO MUCH sand?” honked Goose. “Go swimming? Good idea, Duck!” said Goose, and he raced to the water’s edge. 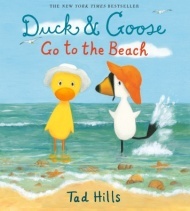 Duck & Goose Go to the Beach is a story of many levels. It presents the idea of having an adventure and doing something new. It deals with facing fears and being open to changing your mind. It’s a fun summer read. Most of all, it is charming and humorous. Duck and Goose are adorable characters. They are who they are, and that trait is so appealing to young readers (and their parents). The oil paint artwork is almost too cute. The images of the feathered friends running down the hill and peeking over the sand dune are picture perfect. The artwork adds to the massive appeal of the book. Whether they’re in a meadow, at the beach, or in your home, your kids will delight in Duck and Goose. Will Churchill realize he’s being a bad friend? Will he find his own tail? Does he even want it back? This delightful tale will engage readers for the creativity of the story, the humorous artwork, and the moral. Does trying to be different mean that you forget your true friends? Anca Sandu answers this question in a realistic and sweet manner that young children will enjoy and understand.